Fun Facts about Frogs to Amaze Your Friends! 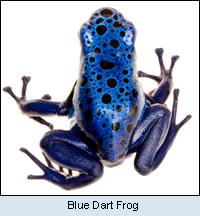 There are lots of interesting frog facts that you might not know, and maybe some frog facts that you do already know. 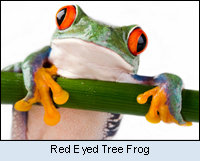 Take a look at these frog facts and see what you can learn. • Frogs are amphibians because they start their frog life cycle as eggs in the water and then turn into tadpoles, which have gills and also live in the water. It isn’t until a tadpole turns into a frog that it can live outside of the water, but it will still need to get in the water to drink and to cool off. • Frogs don’t actually drink water with their mouths; they drink it through their skin. A frog’s skin absorbs water when it is in the water so its body gets all of the hydration that it needs that way and the frog doesn’t need to drink with its mouth. • Frogs are cold blooded. That means that the body temperature of a frog is the same on the inside as it is on the outside. That is why frogs need to be near water so that they can jump in and cool off on hot days. • Frogs hibernate in the wintertime. • When frogs hibernate their bones sort of grow a layer, like a tree does. When you look inside a frog’s bone you will be able to see rings and tell how old the frog is by counting the rings. • Frog fossils have been found all over the world except in Antarctica, probably because it is too cold all year round there for frogs to live. Some of the fossils that have been found are as old as dinosaurs! • A group of fish is called a school, but a group of frogs is called an army. Do you think that is why army colors are green? A group of people is called a group. • Not all frogs are green. There are hundreds of species of frogs and each one looks different. 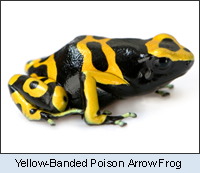 Some frogs are red and some are yellow and some are brown. All of the different species of frogs have different patterns on their skin, too. • One way to tell a male frog from a female frog is by looking at its ears. The ears can be found right behind the frog’s eyes. If the ears are as big as the eyes, then the frog is a boy. If the ears are smaller than the frog’s eyes, then the frog is a girl. • The male frog is the only one who can croak, and every frog species makes its own unique sound and some are not even croaks. Some frogs whistle and some chirp like a bird. • A frog won’t turn into a prince, no matter how many times you kiss him!